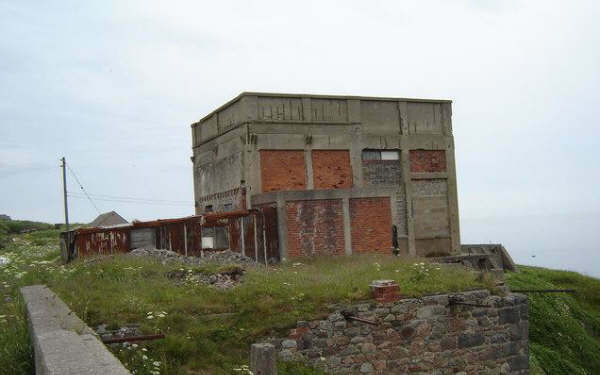 The Remnants of the Fish Meal Factory at Cove Bay (a forerunner to what was planned at Clashfarquhar). Some people’s perceptions of Portlethen are influenced by the smell hanging in the air there at certain times of the day. This can be attributed directly to McIntosh Donald’s meat factory located in the centre of Portlethen, next to the retail park. The smells, vapours, fumes and aromas emanating from the abattoir can be quite powerful, distinctive and, most of the time, unpleasant. Having said that, improvements within the factory, with the introduction of new machinery and filtering systems have resulted in the betterment of the quality of air in the vicinity today. Nowadays the smell is more likely to be noticed as an occasional whiff confined to the areas immediately next to the factory, unlike in earlier years where there was an overwhelming and powerful stench that could occasionally be detected on the coastal villages one mile away if the wind happened to be blowing in the right direction. However McIntosh Donald’s (formerly Donald’s) meat factory wasn’t the first planned factory within the Portlethen district that has caused a smelly controversy, there was a predecessor over forty years prior to Donald’s arrival where the aroma would have been a lot worse. In fact if this factory had gone ahead in 1924, the arrival of Donald’s Meat factory in the 1960’s may have been like a breath of fresh air! How many people were aware that Mr. James M. Davidson, an Aberdeen Fish Merchant submitted a planning application to build a Fish Manure factory at Clashfarquhar, near to Downies Village in 1924? This, in fact, did happen and very nearly became a reality. Originally, an application was made to Aberdeen Town Council to build and establish a Fish Meal factory at Point Law in Torry, however this application was ultimately rejected with the reason stated as “Point Law in the midst of a populous area was totally unsuited to the establishment of a Fish Meal factory owing to the annoyance likely to arise from the transport and handling on arrival of raw material”. From this we are able to establish that there was a need for factories that were capable of handling and processing fish meal and fish guano, but at the same time the construction of any such facility should be made at a distance well away from populated and residential areas. Mr Davidson did his homework and came up with an alternative solution – why not use a site he had pinpointed at Clashfarquhar, near the village of Downies? At this location there were only two inhabited houses within a quarter mile of the site, the rail network was next to it and road transport links were close at hand – all factors that were in his favour. Understandably the local population, on the whole, disagreed with the concept, their chief worries being the smell, the unsightliness of the building and the fact such an industry was likely to discourage further residential or industrial development in the immediate area. 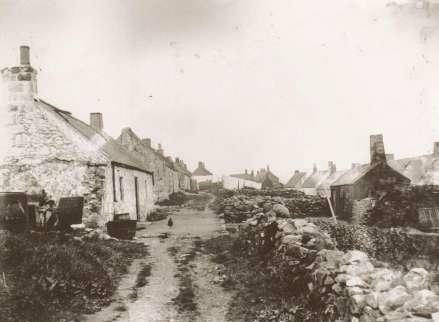 Residents from Portlethen and Newtonhill were particularly vehement in their objections and protestations, the latter village claiming that that they were endeavouring to attract new residents, considerable cost had been spent on improving existing houses and if such a factory was to be built it would be a blight on the landscape and discourage potential investors and new residents. Paradoxically, the nearest village of Downies was mainly in favour of the development and building of a factory on their doorstep. These residents knew which side their bread was buttered and saw potential new job opportunities which would have been a boon in the 1920’s and an antidote to the terminal decline of the local white fishing industry which had the village dying on its feet. Perhaps too, like the fictional village of Ferness in the film “Local Hero”, the villagers saw the lure of big money and a saviour in the figure of Mr. Davidson, so much so that they ignored the environmental constraints that such a development would possibly have on the area. The smell of money, in all likelihood, outweighed the smell of dead fish. For those interested in statistics a total of 381 local residents had petitioned against the scheme whereas a figure of 175 local residents had registered support for the factory to go ahead. There were, however, a considerable array of other objectors in addition to those residents in Newtonhill and Portlethen, and these included the Education Authority, the Educational Trust, Stonehaven Town Council, Aberdeen District Committee, Kincardineshire County Council and most of the local landlords. With those influential groups against the development of the factory Mr. Davidson’s planning application was refused and it appeared that would have been the end of it. Mr. Davidson made an appeal to the Scottish Board of Health and this was heard in Stonehaven near the end of 1925. After many months of long deliberation a decision was reached on the 31st July 1926 where it was intimated that the Scottish Board of Health had approved of the details of Mr. Davidson’s scheme, and despite the local protestations that had been made previously, they went ahead and granted a license for the establishment of a factory at Clashfarquhar. The objectors, in return, made a counter appeal to the Secretary of State for Scotland to overturn the Scottish Board of Health’s decision and so followed a full enquiry that resulted in “experts” being called upon to give advice and evidence on behalf of both sides. One subject that frequently cropped up in the ensuing debate was that of an existing Fish Meal factory that was located in the settlement of Cove Bay, approximately six miles north of Clashfarquhar. Most of the comments in respect to the Cove factory were of a negative nature; that it was a nuisance on account of the smell (“Any passer in a train, when the wind is in the east, can testify to this and the fumes are carried and are offensive for a great distance”); that the factory there was underused and can handle all the local business there is without the need for another factory; that residential building at Cove had ceased on account of the factory being there. It was admitted that the factory in Cove was a nuisance and that the problems with the smell there were real however it was also argued that new technology would ensure that the factory at Clashfarquhar would not suffer the same fate. Local residents also argued their case that “Now the day of the smaller fishing villages is passed much development is the chief hope for the future of this part of the county and as the local conditions are so favourable these prospects are high. It is therefore a great hardship that such hopes should be blighted by the erection of a factory which no one in the locality wants”. There was also some doubt about the factory’s ability to prevent contamination and pollution in respect to the way it planned to handle offensive effluence and waste (through waste pipes running near to Burn O’ Daff to an outfall in the sea at the mouth of the same burn). Mr. Davidson and his lawyers hit back by producing additional drawings, photographs, using experts with scientific and technological expertise. The Scottish Health Board quoted circumstances where some of their officers had visited Mr. Davidson’s other factory in Glasgow and “stood over the outlet tower in the line of the escaping vapours but were unable to discern any trace of the characteristic noxious odour of the vapours from the concinerators”. It was also stated that the processes inspected at Glasgow would represent, in experimental form, the principles to be embodied in the Clashfarquhar plant. It would appear that Mr Davidson had expertise, technology, an official government body, and all the commercial benefits stacked in his favour whereas the objectors were more concerned about the environment, keeping the status quo in the area and were worried that, potentially, they would be living in a stinking environment for years to come. Given these circumstances you may have thought that the Secretary of State for Scotland was more likely to give Mr Davidson their backing and rubber stamp the decision passed out by the Scottish Health Board. Instead they backed the objectors and the Fish Manure project at Clashfarquhar was confined to the bin. From that point onwards the site at Clashfarquhar was not looked at again as a potential industrial area, although Mr Davidson tentatively proposed shifting the original site approximately half a mile eastwards to a location where the farm at Burn o’ Daff is sited. Today the locations in this area are still a mix of wild and agricultural land. Was this the right decision, or did the Secretary of State go by his heart rather than his head? Maybe he was rather perceptive in the decision he made because even up to the 1980’s there were still problems being created by Fish Meal processing plants and their associated smells. Who can recall the controversy of the Fish Meal factory in Tullos with its related “pong” and how long that particular debate had to run before being sorted out to everyone’s satisfaction? I believe that it was the correct decision to forego the site at Clashfarquhar as a place for processing fish waste. Downies isn’t a village where you would expect to have to contend with the constant smell of processed, rotting fish waste, and is more suited to the fresh and bracing sea breezes that fill the air. Now, what can we do about all those farmers who insist on “muck-spreading” over their fields two or three days every year?